The Wisconsin Frog and Toad Survey (WFTS) was initiated in 1981 by Ruth Hine and Mike Mossman of the Wisconsin Department of Natural Resources (WDNR), in response to concerns over declining populations of northern leopard frogs, Blanchard's cricket frogs, pickerel frogs, American bullfrogs and possibly other anuran (frog and toad) species. This concern was not only for the species themselves but also for the ecosystems on which they depend. The purpose of the survey is to increase our knowledge of anuran abundance and distribution, and to monitor populations over the long term. Our methodology was developed under the leadership of Ruth Hine and Mike Mossman, with the recommendations of Debra Jansen and Ray Anderson of UW-Stevens Point. We spent 3 years, 1981-1983, testing methods, especially regarding the number of stations that could be surveyed realistically in one night, the use of the call index, and fitting survey periods to species' calling phenologies. The WFTS was blessed with a source of capable and willing volunteers through other volunteer programs such as the statewide black tern survey, Scientific Areas bird survey, and federal breeding bird survey. Others were enlisted through organizations such as the Wisconsin Society for Ornithology and Phenological Society. The WFTS established standardized protocols and began statewide coverage on permanent routes in 1984. 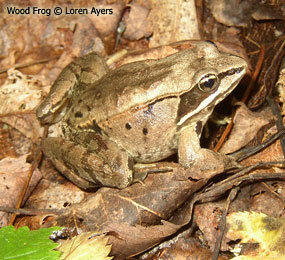 Beginning in 1991, we expanded our early spring survey period because observers had been noting that the period began too late to sample wood frogs during years in which spring arrived especially early. It formerly began on 15 April, and now begins on 8 April. In 1997 and 1998, we ran an additional 80 routes selected by the North American Amphibian Monitoring Program (NAAMP) stratified-random protocols in order to test for differences between data collected on NAAMP routes and traditional WFTS routes. Of these NAAMP-based or "protocol" routes, 40 had stations placed at half-mile intervals along randomly selected routes, regardless of proximity to wetlands; the other 40 routes were placed along randomly selected routes at sites at least a half mile apart but within 200 meters of wetlands judged by the cooperator to be potential breeding habitat. A small number of these "protocol" routes are still being run. 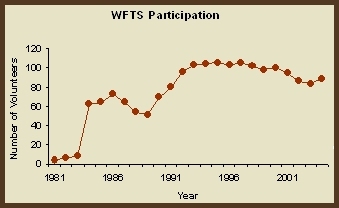 In 2006, we updated our website and created the "WFTS Survey Manual", which includes information from the previous "Instructions" and "Natural History Information" packets. Wisconsin has been the model for many frog monitoring projects in the United States and internationally. The largely successful NAAMP project was also modeled after the WFTS. Currently, we have about 100 permanent roadside routes, most of which have been run for several years, and a few of which have been run annually since 1981.